When you notice white, powdery residue on your plumbing fixtures, dishes or other surfaces touched by water, you have water that is too hard. Hard water is water high in mineral content, mainly calcium and magnesium. These minerals show on surfaces as the water evaporates, leaving a hazy white tint and, over time, hardened crystals. Soap is difficult to lather and your washing detergent doesn’t clean clothes thorough enough. Dry, rough or sticky hair and itchy dry skin. Soap scum on glass shower doors, walls and tubs, as well as residual detergent on dishes and washed clothes. Clothing colors less vibrant after washing; garments feel itchy or dingy. 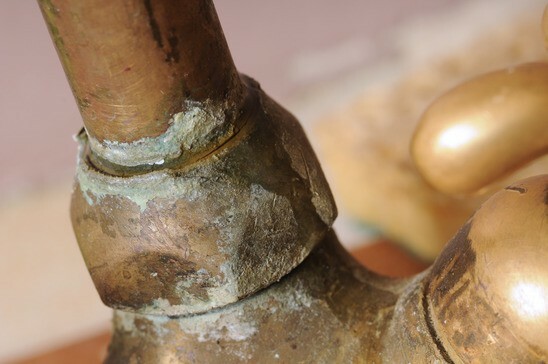 Damaged plumbing and reduced water heater efficiency due to scale buildup. Over time, mineral deposits can cover the inside of the pipes, causing them to narrow down and reducing their water-carrying capacity. Water-handling appliances, such as washing machines and water heaters may fail prematurely because of excessive water hardness. Solution: you need a water softener. Not only does it fix all of the above, but also makes cleaning easier and faster, increasing effectiveness of soaps and detergents that will last you longer. Soft water allows your skin to stay more hydrated; hair will be softer and more manageable.